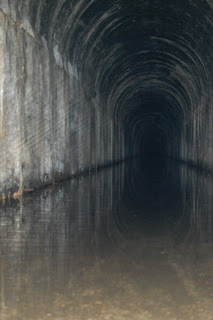 Today I explored an abandoned rail tunnel under Stevens Pass. The Old Cascade Tunnel was completed in 1900 to replace switchbacks that originally scaled the full 4000-ft elevation of the pass. The western portal of the tunnel was the site of a horrific avalanche that killed 96 people in 1910. Over the winter of 2007/08, another avalanche in the same location caused a cave-in not far from the western portal. I approached from the east (walking 3km each way!) and was stopped by water dammed by the cave-in. It has become a lesson for future rail engineers, as it was built on a steep grade that caused locomotives to pollute the tunnel. It's since been replaced by a much longer tunnel that's still in use by the BNSF railway. There's also a geocache there.